Frances Daly Fergusson became the ninth president of Vassar College on July 1, 1986. Her inauguration coincided with the 125th anniversary of Vassar's founding. During her term as president, Ms. Fergusson has inspired philanthropy unprecedented in the history of the college. She has been a passionate advocate for education, and particularly liberal education, both here and abroad, and she has transformed a genteel but aging campus into a vibrant center for intellectual exchange. A noted architectural historian, Ms. Fergusson states, "Both buildings and landscapes at Vassar have been carefully preserved and restored, and new interventions reflect a continuing visual dialogue with the ideas and the ideal of the campus." In addition to her work at Vassar, Ms. Fergusson has served on the boards of many educational and philanthropic institutions. She is currently serving a six-year term on the Board of Overseers of Harvard University. Previously, she was a member of the Board of Trustees of the Ford Foundation from 1989-2001 and chaired its committee on education, media, arts, and culture, and its proxy committee. In recent years, Ms. Fergusson has made trips on behalf of the Ford Foundation to Brazil, China, Indonesia, Mexico, South Africa, Mozambique, Namibia, Nigeria, Senegal, Mali, Zimbabwe, Russia, and the Czech Republic to study and report on the Ford Foundation's programs and activities in those countries. Ms. Fergusson was a member of the Board of Trustees of the Mayo Foundation, also known as the Mayo Clinic, from 1988-2002, and chair of its board from 1998-2002. A not-for-profit medical institution with an annual budget of over $4 billion, the Mayo Foundation includes the renowned Mayo Clinic, the Mayo Medical School, the Mayo Graduate School of Medicine, the Mayo Graduate School, and the Mayo School of Health-Related Sciences, as well as hospitals and affiliated health practices. Ms. Fergusson is on the executive committee of the New York Commission on Independent Colleges and Universities (CLCU), and has also served on the board of the Society of Architectural Historians of the United States, the Board of Directors of the National Association of Independent Colleges and Universities (NAICU), and the Board of Trustees of Historic Hudson. She is a director of HSBC Bank North America, and served as a director of CH Energy Inc. from 1993 to 2002. A past member of the Board of Directors of the United Way of Dutchess County, she was the 1991 campaign chair for Dutchess County. Ms. Fergusson is the recipient of many honors and awards. Most recently, in October, 2002, she was inducted as a fellow of the American Academy of Arts and Sciences. In 1998, she received the Eleanor Roosevelt Val-Kill Medal and was chosen by Vanity Fair as one of "America's 200 Most Influential Women." In 1999, she received the Centennial Medal of the Graduate School of Arts and Sciences, Harvard University. She is a 2001 recipient of the Alumnae Achievement Award of Wellesley College, and of the Doctor of Literature degree (honorary) from the University of London. 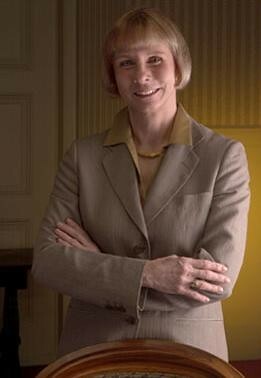 Ms. Fergusson previously (1982-1986) was provost and vice president for academic affairs at Bucknell University. She was also professor of art at Bucknell. While at Bucknell, she served as the founding chair of the policy committee of the Patriot League (Division IAA football) and as a member of the Bucknell University Press editorial board. Ms. Fergusson was also a member of the National Endowment for the Humanities national study group which produced the report "To Reclaim a Legacy" in 1984. Under Ms. Fergusson's leadership, the 1,000-acre Vassar campus has had major additions and renovations to many of its buildings and to its landscape, which includes an arboretum and a nature preserve. New buildings include the Frances Lehman Loeb Art Center and the Center for Drama and Film, both designed by Cesar Pelli, the Class of '51 Observatory, and the Priscilla Bullitt Collins Field Station. A major addition to the Vassar Libraries, designed by Hugh Hardy, and greatly enhanced athletic facilities opened in 2000. Additions to the academic offerings have included the development of a strongly multidisciplinary Environmental Studies Program and a Jewish Studies Program, as well as the integration of technology into disciplines across the curriculum. President Fergusson also has strengthened the budgetary processes and the finances of the college, involving faculty and administrators in collegial partnership to study every aspect of the college's operations and develop a long-range financial model. Acknowledging these advances, the college recently received an upgrade in its bond rating from AA- to AA, an unusual shift upward in the current financial world. A graduate of Wellesley College in 1965 with special honors in art history, Ms. Fergusson went on to earn her master's and doctoral degrees in art history at Harvard University. She was named a National Endowment for the Humanities Fellow in 1974-75 and a Radcliffe Institute Fellow in the same year. She is a member of Phi Beta Kappa. In 1979 she was elected a Danforth Associate for excellence in teaching and commitment to students. Ms. Fergusson's career in teaching began at Newton College (merged in 1975 with Boston College) in 1969 as an assistant professor of art. She later became chair of the Art Department and director of the Division of Humanities and Fine Arts. In 1975 Ms. Fergusson was appointed an associate professor of art at the University of Massachusetts at Boston, where later she was director of the Urban Studies Program, director of the American Civilization Program, and faculty representative to the Board of Trustees. From 1980 to 1982 she served as assistant chancellor of the University of Massachusetts at Boston. She has published widely in her academic specialty, architectural history; her work has emphasized the reuse of historical styles by later generations of architects and the meaning given to those revivals. She won the Founder's Award of the Society of Architectural Historians for her study of St. Charles' Church, Vienna.